After graduating high school with a desire to incorporate her love of writing into her life's work, Erin McMullen wasn't sure what she wanted to do. She enjoyed the written word, but did not want to enter creative or fiction writing. After two years at Monmouth University, she has steered herself toward journalism by choosing to become a communication major. "I have always wanted to do something with writing, but I flip-flopped on what I was actually going to do," McMullen said. "My years at Monmouth have only strengthened my passion. I came here because of the class sizes — I didn't want to go to a big school where I would be just a number — plus the campus is gorgeous and near the beach." After spending her freshman year as a writer, McMullen became an editor at the student-run newspaper The Outlook and has also embraced several opportunities to travel as a student. "Since I became a Monmouth student, I have never been more sure of my decision to pursue my goal of one day becoming a journalist. Between all of my extremely helpful and experienced professors, as well as my involvement with The Outlook, I discovered a new-found passion for my major. Monmouth has provided me with all of the right tools to exceed in my intended field and I could not be more grateful." After traveling to San Diego for an Associated Collegiate Press National College Journalism Convention in March 2014, McMullen is preparing for a trans-Atlantic student travel experience. "Monmouth has also provided me with the chance to study abroad in London, England for the Fall 2014 semester, an opportunity that I never thought I would have. After only completing two years at Monmouth, I feel more confident in myself and my abilities than I ever thought possible." 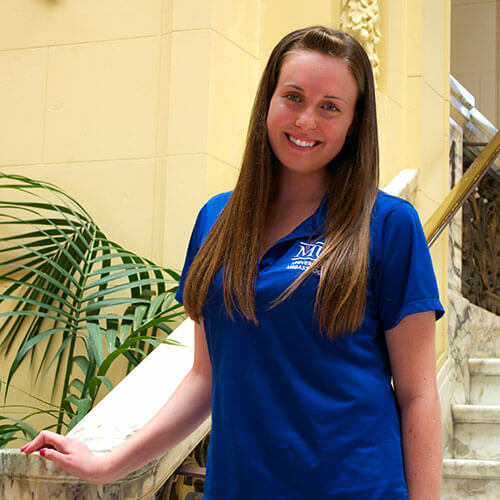 "As a student ambassador, I have been giving tours to prospective students since my freshman year at Monmouth. It is fun to talk to different families about what the University has to offer. "Additionally, I have been involved with The Outlook since my freshman year - first as a staff writer, then as a copy editor, and now as a section editor. I've already learned more about the field than I thought I would. "As a freshman, I also became a founding sister of the Iota Theta chapter of Alpha Omicron Pi here at the University during my first year. I never thought I would be involved in sorority life, but it was a great opportunity to start something new on campus. It was definitely one of the best decisions I've made. As a freshman, I was also involved with the First Year Service Project, where we worked to put an end to world hunger." "I am proud of Monmouth University because so many students go on to do amazing things with the knowledge they've gained from their time here. I feel like I've learned so much, and I only just finished my sophomore year. My professors and fellow classmates have inspired me to do well and succeed, regardless of how difficult things may get. "In particular, I liked my introduction to journalism course with Lauren Payne. It was the first three-hour course I had to take and I was a little worried, but I ended up enjoying every minute of it. She was a senior editor for magazines such as Woman's Day and Ladies' Home Journal; to have her teach me was awesome. It is wonderful to think that these types of opportunities are available here at Monmouth."